Give a big howdy to Tom the Troll. He's not real bright, but he is big! Fun polystone statue of Tom the Troll from The Hobbit: An Unexpected Journey. Sculpted by the creature designer for all 3 trolls in the movie! Stands about 6 1/2-inches tall. Hey, watch your step there! 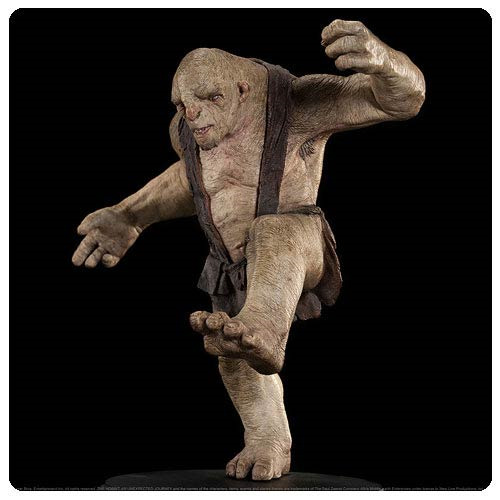 An open edition, this fun polystone The Hobbit An Unexpected Journey Tom the Troll Statue measures about 6 1/2-inches tall x 5 9/10-inches wide x 4 3/10-inches long. Sculpted by creature designer Andrew Baker, who did the conceptual designs for the trolls and other creatures in the movie The Hobbit: An Unexpected Journey, it belongs in every The Hobbit collection. What's for dinner, Tom? A finely detailed miniature collectible, The Hobbit An Unexpected Journey Tom the Troll Statue features the dimmest of the three ruffian Trolls who had plans to cook the Company as they ventured on their quest to reclaim the Lonely Mountain. Ages 14 and up.